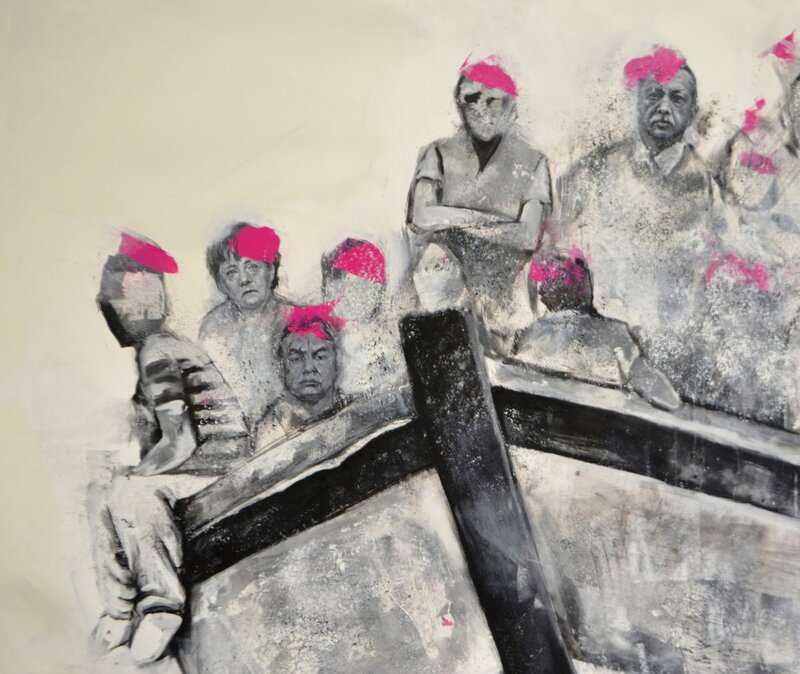 "The Boat" is a work in progress, as leadership is passed on and problems inherited." 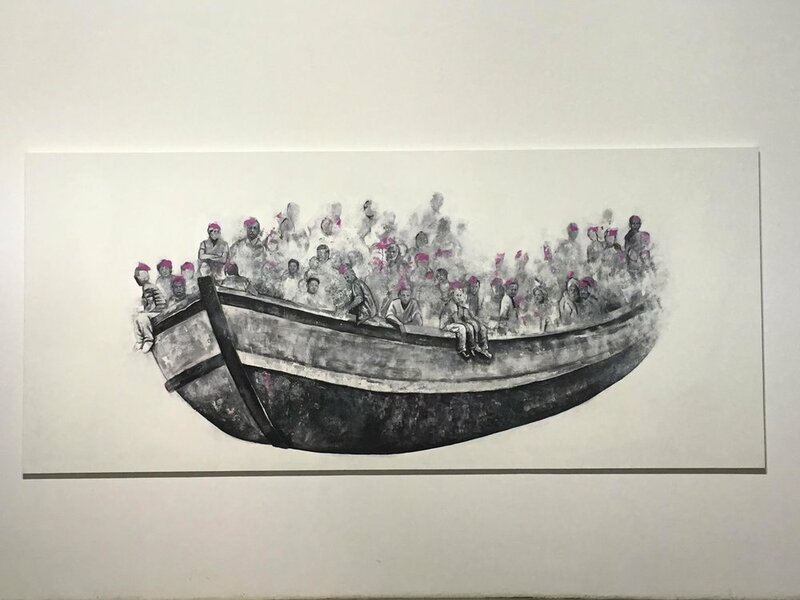 The Boat is a part of "The Vulnerability Series" the internationally renowned project of visual artist Abdalla Al Omari, where he painted portraits of world leaders as refugees, challenging the notions of vulnerability and power. 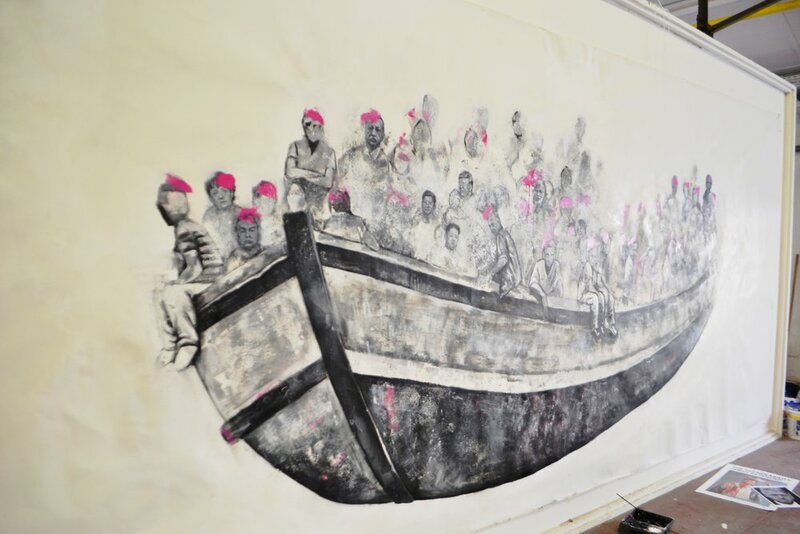 Painting world leaders together in a rickety wooden boat as refugees trying to find a better future emphasises the shared responsibility for the state of the world.The painting can be viewed as a work in progress, as leadership is passed on and all problems inherited. One can find the faces of Xi, Trump, Obama, Merkel, Macron, Orban, Assad, May, Kim Jong Un, Cameron, Putin, Modi, King Salman, El Khameini. The leaders are often shown in provocative combinations, ironically challenging current relations between them. Starting this work beginning of 2017as a mural in Cultuurcentrum Strombeek , Belgium. Reproducing it on canvas in Hamburg's Affenfaust Galerie and Lemonaid during G20 Summit 2017. Adding more familiar faces, where it was shown at Mystetskyi Arsenal National Museum Kiev, during "YES "Yalta European Strategy" Conference 2017, curated by Pinchuk Art Centre, alongside other internationally leading artists like: Marina Abramovic, Andreas Gursky, Damian Ortega, Santiago Sierra. The Boat recently was shown in Gangwon International Biennale 2018 South Korea, titled "The Dictionary of Evil", the Cultural event directly linked to Winter Olympic Games 2018. Presented alongside other international artists including : Thomas Hirschhorn,Tammam Azzam, Akram Zaatari. Al Omari did a live painting performance where he added the faces of Moon Jai-In next to Kim Jong Un The Presidents of South and North Korea in front of Korean Audience.